You’ve got a problem. You and your team manage your own paid search account, and your monthly PPC report shows a definite trend, and it’s downward. Or maybe you work with an outside agency, and although they’ve been hustling for years you’ve got a heavy feeling in your stomach telling you that your account isn’t getting the attention it deserves, and that you’re missing out on the results you could be getting. No matter how you got to where you are, you’re ready for some help, and you’re looking to talk with a new PPC agency. But how do you go about finding the right one? If you don’t already have a trusted referral, these are difficult waters to navigate. A Google search will show you there is a lot of competition out there, and you know that choosing the wrong agency will set you and your company back from achieving your goals and objectives by months, maybe even years. Surprise! The first question to ask isn’t to a PPC agency you’re considering hiring, but to yourself–is paid search (PPC) really the right channel to achieve your goals? There are many options out there for achieving your goals, and maybe PPC is the best option, but it’s always good to compare it to SEO and make sure. 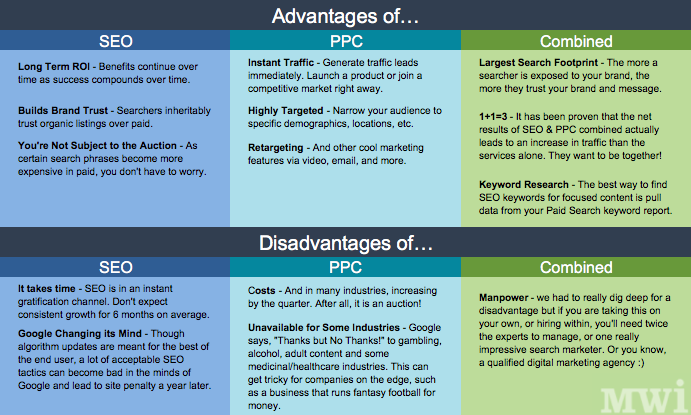 Here’s a handy SEO vs PPC chart. Full Disclosure: I run the marketing and strategy department at MWI and think that any business can benefit from some kind of PPC service. To me, It’s more of a question of how much money should be utilized in each tactic. For instance, if you are a start-up with a brand new product that no one has ever seen and is going to revolutionize the market, paid search isn’t really going to be the best driver. You’d be better suited building your brand, explaining your story, and building initial volume before you start spending money to capture those searches. Now that you are ready to begin looking for a PPC agency, a Google search is a great place to start. The company’s website should be able to quickly explain their specialty in the market, contain case studies, and illustrate team culture. You are trusting this company to manage your paid search channel, so testing how they do it for themselves is a great start. I recommend choosing at least three agencies to contact and send them through the below questions. This may seem counter-intuitive, but in today’s digital marketing landscape no service line works in a complete vacuum. 99% of sales leads take multiple touch-points and different service lines are better equipped for different areas of the funnel. Even if you chose this agency to only handle paid search, if they are competent in other areas of digital marketing, they can glean tips and tricks from different parts of the funnel and in turn, be better equipped at handling your paid search. Not to mention, if you run into a problem with your PPC they have the ability to switch gears seamlessly. At our agency, we’ve run multiple accounts where adding facebook ads to the mix help boost paid search effectiveness as high as 30%. Google/Facebook/Bing/etc. has recognized the importance of quality agency’s and how they help their own business. An agency with a dedicated rep has access to beta programs and additional information that is not released to the general public. Not to mention, a direct line to the source for any troubleshooting necessary. The Director of Paid Media or Director of Marketing, even better, the actual person doing the execution is important to judge the level of expertise within the building. The salespeople are the tip of the iceberg. And if these studies are specific to your industry that’s even better. A digital marketing agency does not need to specialize in your industry to be a good partner but if they do, it significantly shortens the ramp-up time. Sample reporting gives you a view into how this agency thinks and what kind of analysis you will receive. This is an area where many companies skimp and just deliver an excel printout with data and no analysis. If you have the time and team to review the data yourselves this might work, but for most companies, that is a luxury they cannot afford. Having an agency that can explain trends, and layout a plan of attack is key. Even if you don’t go with that agency an audit is always a good thing to put into your back pocket. The initial account setup is always the most time consuming part of any PPC arrangement and many companies may not actually need a full tear down. The best analogy to think of is the roof on your house. Every 10-20 years you may need a new roof, but if you are moving into a new home, it may not be necessary. As is with everything digital, those 10-20 years is a much shorter timeframe, more like 2ish years for a new structure. PPC is a KPI driven service line so make sure you create your KPI’s, rather they be sales, leads, or brand awareness, and work with the agency to make sure they are hitting those goals. 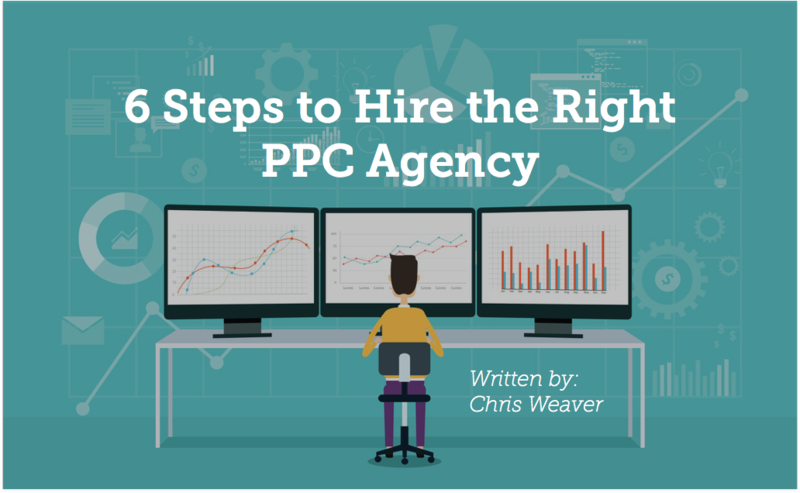 Have you recently hired a firm to manage your PPC? How did you make sure you found the right one? Any other tips you’d recommend? Or things that I missed? Let us know in the comments. If you’re interested in tips for hiring an SEO Agency? Check out this Forbes article from Josh Steimle, founder of MWI. Chris brings nearly a decade of digital marketing experience with a strong background in leadership and strategy. He oversees the Paid Search, Display, and Paid Social teams at MWI while also having a strong understanding of SEO and content marketing. Chris takes an analytical approach to solving problems and is passionate about taking an idea and turning it into a high quality result that clients can be proud of. Outside of the office Chris can be found outside, camping, kayaking, and hiking with his friends, family and two dogs Addie and Smokey.